Permission to add the BPS published article”Dyadic Developmental Practice – A Framework for Therapeutic Intervention and Parenting” to the website has kindly been given by the Division of Clinical Psychology Faculty for Children, Young People and Their Families. It has been added to the DDP Resource Library where you can find a downloadable PDF. 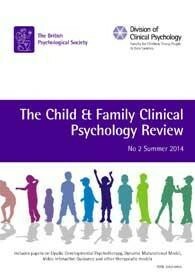 The paper’s authors are all UK Chartered or Registered Psychologists, Therapists and DDP Practitioners and Consultants. Dyadic Developmental Practice (DDP) provides a framework for supporting looked after and adopted children to recover from trauma through the therapy, parenting and support they receive. In the article the model is briefly described before discussing the range of ways that DDP is influencing practice in the UK. Case studies illustrate this and the developing evidence base is described. We appreciate being given permission to add this article, published in the Summer 2014 Review. The review’s mission is to promote and share good quality clinical writing and research within the field of child, adolescent and family clinical psychology. The full Review is available to buy for £4 from the British Psychological Society shop.